South of Furnace Creek, road 190 passes the Hwy 178 junction then climbs into the Grapevine Mountains towards the atmospheric town of Death Valley Junction. Two miles south along 178, Golden Canyon is a short gorge that cuts into brightly colored sandstone rocks in many glowing shades of orange, gold and red, with the ever-present deep blue sky above making the hues seem especially sharp and intense. A paved road once ran the whole length but this has long been disused and most sections have eroded away. Now, travel on foot is the only option, and the hike is one of the most popular in the national park; combined with a return via adjacent Gower Gulch, the journey is 4.3 miles round trip. Trail guides describing numbered points of interest are available at the nearby carpark. Golden Canyon topographic map, Map of Death Valley National Park and surroundings. 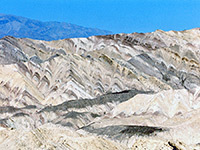 14 views of the Golden Canyon/Gower Gulch/Zabriskie Point area. 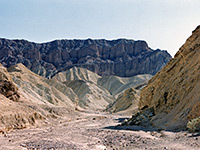 The Golden Canyon trailhead is 3 miles from Furnace Creek on the east side of Hwy 178, at the end of a very short side road. The canyon is not particularly enclosed though some of its short tributaries are more narrow. 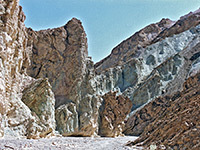 From its abrupt beginning at the edge of the cliffs lining Death Valley, the drainage gains elevation gradually, branches several times then ends quite suddenly after about a mile, at the base of high sandstone cliffs - a natural amphitheatre known as Red Cathedral, where the majority of visitors turn back though a longer trail continues eastwards through multicolored badlands to Zabriskie Point, a total distance of 2.7 miles. The trail junction is several hundred feet south of the cathedral; the path starts by climbing quite steeply up an exposed slope of whitish earth to a second intersection on a high ridge beneath a protruding rock formation, a point which overlooks a wide area of fantastic badlands and canyons. To the north, the main trail continues climbing towards the Zabriskie Point overlook while the other branch, which seems much less traveled, drops down through the undulating mounds and on to the bed of the next canyon, Gower Gulch. This wash is at first rather wider than Golden Canyon but has similar bright colours and stark, eroded formations. For about half a mile the floor is flat and sandy, bordered by sloping sides beneath more polychromatic dunes, then the gulch becomes more enclosed, rocky and steep-sided, with one narrow place and a four foot dryfall. Around here are a number of tunnels, relics of borax and calcite mining early in the 20th century, and some nice crystals can still quite easily be unearthed. The rocky section lasts another half mile and ends with a 20 foot drop at the edge of the hills, beyond which the canyon changes to a wide stony wash that spreads out into the great expanse of the main valley. A path skirts the dryfall and follows the base of the foothills back to the Golden Canyon trailhead - in total this is a 4.4 mile, 2 hour round trip through very spectacular scenery.